FBI agent Malcolm Turner is known best for being a brilliant, master of disguise. Malcolm's latest assignment sends him to small-town Georgia, where he's assigned to trap a brutal bank robber (and a recent prison escapee) who they suspect will be coming down to visit his ex-girlfriend Sherry and her son. Malcolm sets up a stakeout across from the home of a larger-than-life southern matriarch known as Big Momma, who's about to be visited by Sherry. It's a simple plan, but there's one big problem: Unbeknownst to Sherry, Big Momma has unexpectedly left town. So Malcolm, decides to impersonate the cantankerous Southern granny. Using a few tricks of disguise, he completely transforms himself into Big Momma, even taking on the corpulent septuagenarian's everyday routine-from cooking soul food to delivering babies to "testifying" at the local church. In the mean time, Malcolm starts falling for Sherry, who may or may not be hiding some stolen cash. Now, Malcolm/Big Momma must somehow find a way to nab his criminal and the girl. Where'd you steal this, since your English in other posts is wildly inconsistent with this item? 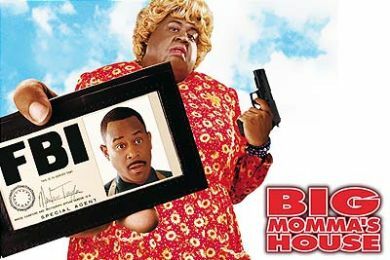 “Big Momma’s House” is rated PG-13 for crude humor, sexual innuendo, language and some violence.